Ever see the Lord of the Rings movies, or read the books? Ever notice how the series ends with Sam coming home to his house in the Shire with his wife and young children? Ever wonder what happened to Sam Gamgee and his family after the events of the Trilogy? If so, then Lord of the Rings: Aragorn's Quest is the game for you! 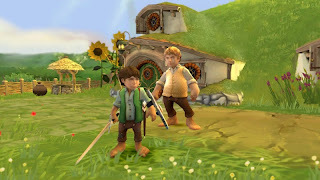 You play as Frodo Gamgee, Sam's young son. You frolic around in the Shire, swinging a wooden sword, and listening to your father recount the events of the War of the Ring. And it's during these storytelling sessions by the fireside at Bag End that the real gameplay occurs. 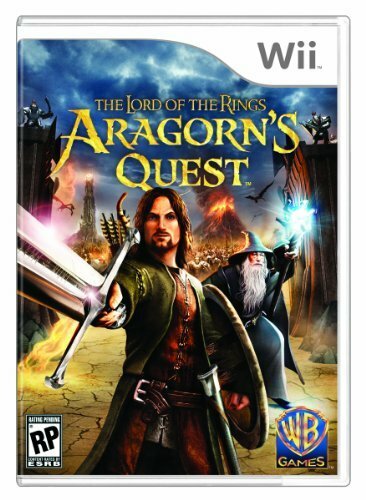 You get to control Aragorn through eight different open-world levels representing different scenes from the Trilogy, wildly swinging your Wii-mote to slice up the forces of Mordor. The Lord of the Rings Aragorn’s Quest is a simple game that’s so tough a breeze could knock it over. So why take the trouble to breeze through this title? Read on to find out why I find it one of the most enjoyable gaming experiences of the year. The game is as pleasant as it is easy, especially (or perhaps only) for a Lord of the Rings nut such as myself. The narrative doesn't quite follow that of the movies or of the books, but it borrows from both - while also injecting a little extra action to make the levels more "playable." Because, I mean, you know, staying faithful to the LotR mythology is one thing, but when I play a video game, I want to slash some damn orcs with my Wii-sword, you know what i'm sayin'? 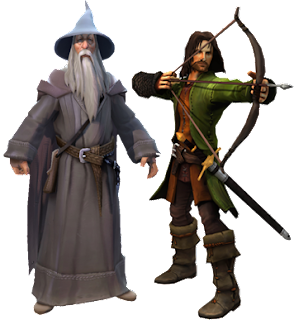 The chronology is all the same, but the game drops some extra obscure references to Lord of the Rings mythology left out of the movies. For example, who knew off the top of their heads that, when Aragorn first came to live with Elrond in Rivendell as a child, he was given the name "Estel?" Well, I did, and I was extra-pleased when Sam the narrator mentions it during a cutscene. The game also corrects some mythological inaccuracies from the movies. For example, Aragorn wields a sword, called Anduril - which, in addition to being a pretty badass magical sword, is also the one defining token of his character, since it symbolizes his lineage and proves that he's the rightful heir to the throne of Gondor. In the books, Aragorn claims the sword before the Fellowship even begins their quest. In the movies, he somehow waits until the middle of the THIRD MOVIE to use the sword and really become the Aragorn we know and love. In the game, it's nice to see Aragorn get the sword at the right time - if only to introduce the Strength Meter to spice up the combat. There are also subtle jokes regarding Middle Earth trivia. During one story-time cutscene, Sam's daughter Elanor makes a comment that she likes hearing about Lorien, the beautiful golden Elven forest. Well, that's funny because Sam named her after the flowers that grow in Lorien, because he liked them so much, him being a gardener and all. It's nice to see that kind of clever attention to detail. If only the combat system were as detailed as the references. The slashing aspect is fun, but it's directional-specific slashing, which more often than not makes you look and feel silly when it doesn't register correctly (performing a downward cut when you meant to do a forward thrust, etc.) and you just end up flailing wildly to try to correct yourself. Swordplay in Wii Sports Resort was actually a pretty effective training tool for the mechanics of this game. The combat mechanics anyway. 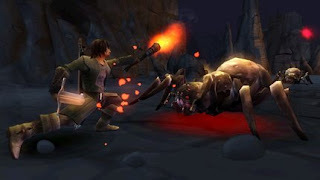 The regular gameplay is rather familiar, utilizing elements found in the Grand Theft Auto format (running around in a sandbox, talking to people to find quests) and the Zelda series (using sword and bow and magical powers to defeat mystical enemies), while borrowing heavily from the visual style of Fable (look at how big their hands are!). It's neither a straight brawler (The Two Towers, Return of the King) nor a Final Fantasy clone (The Third Age), thus it adds something unique and different to the stable of LotR games on the market. The Movie's Sam (Sean Astin) did all new voice recordings for the narration. The Movie's Gimli (John Rhys-Davies) recorded some limited new dialogue. For most everyone else (including Viggo Mortensen, Ian McKellen, Elijah Wood, Hugo Weaving (Elrond too), and Liv Tyler) they lift audio straight from the movies. For one notable exception (Orlando Bloom as Legolas) they use voiceover work from a soundalike rather than lines taken directly from the movies. This is likely because Legolas and Gimli follow Aragorn around through adventures that don't quite take place in the films, so they needed audio of them reacting to new things (cave spiders in Moria? Why not, I guess...). You will be the Mayor, of course, as long as you want to be, and the most famous gardener in history; and you will read things out of the Red Book, and keep alive the memory of the age that is gone, so that people will remember the Great Danger and so love their beloved land all the more. And that will keep you as busy and as happy as anyone can be, as long as your part of the Story goes on. As you (the gamer) re-live these stories through Sam's re-telling, you become part of the Shire, learning from its most renowned citizen about the events that shaped Middle Earth as we know it. And that's all I've ever hoped for, regarding The Lord of the Rings - to become a part of the story.